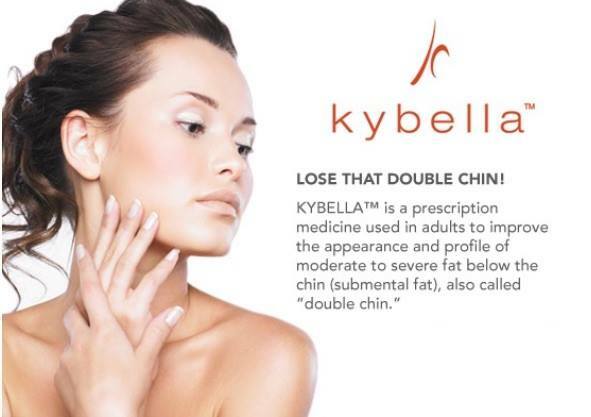 Kybella™ is the only FDA approved injectable designed to eliminate submental fat, also known as a double chin. It can also be injected into bra bulge, saddle bag area, love handle area and upper back. Read the Kybella™ FAQ below. Kybella™ is the only FDA approved injectable designed to eliminate submental fat, also known as a double chin. It can also be injected into bra bulge, saddle bag area, love handle area and upper back. What are the risks of Kybella™ injections? Approved by the FDA to safely eliminate submental fat, Kybella™ holds few risks when used by an experienced provider. The most common side effects of a Kybella™ treatment can include swelling, bruising, and temporary numbness. While Kybella™ is not considered painful; there may be mild discomfort and pressure below the chin. For this reason, a topical or local anesthetic can be used prior to treatment. At The Skin Loft Med Spa, a Kybella™ treatment session will take less than 30 minutes to perform.